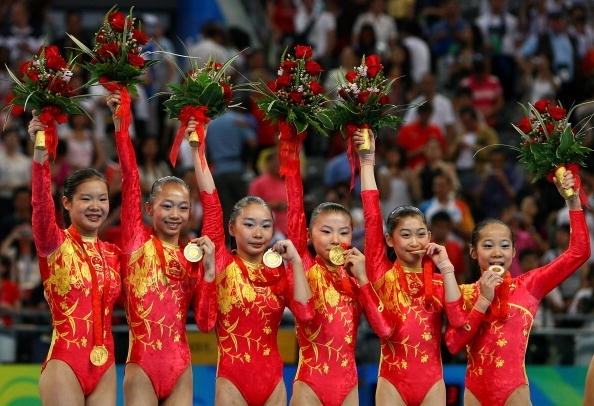 While the controversy over He Kexin and possibly underage Chinese gymnasts at the 2008 Olympics might soon be water under the bridge, to me it is an important indicator of what we can expect from the Chinese government on the world stage. After all, the popular perspective is that they wanted the 2008 Olympics to be just that—a demonstration of their significance in the world. Before some of you get worked up, we can also acknowledge that other governments, such as the United States, have their fair share of problems. But this post is not about who is better; rather, it about the high probability that not only did the Chinese gymnastic team cheat by using underage competitors, but the Chinese government was involved in provided false documentation for them. That said, age falsification in particular is more associated with a communistic governments than democratic. There is a list here of known age controversies in gymnastics, and you can see all the countries involved are associated with communism. Moreover, the last country involved in an age controversy was China. Reports by Chinese newspapers and rosters from competitions in 2007 and 2006, respectively, report her age as 13 and her birth year as 1994. There is a past history of deception, most recently by China at the 2004 Olympics. To me, it is pretty clear that her age is really 14, which means that a fraudulent passport was presented to the IOC. I have hard time believing that the team’s coach or even the Chinese gymnastics association would have taken the risk to arrange for a fake passport on their own, so that pretty much implicates the Chinese government. That is a problem, but its also a circular argument. The coach is trying to say that government documents are universally valid. Its a government document, so it has to be valid. The truth though is that government documents are sometimes falsified by the issuing government. I would advise the good coach to refer to the case of Yang Yun. Of course they are. They’re indignant because they’re on the hot seat. Everyone accused of a crime acts indignant. This means nothing. China’s deputy sports minister, Cui Dalin, would like to have you believe its a clerical error. Its starting to sound like they are throwing in the whole kitchen sink here. The problem with this theory is He Kexin’s age was reported as younger not once but many times over the course of approximately 1.5 to 2 years. Moreover, it was reported in public ways. If it was wrong, it would have been noticed and corrected long ago, not suddenly in the 6 months before the Olympics started. in his youth he had once changed his age to participate in competition with younger players. “It used to be very common, but it is getting less and less so,” he said. So…you admit you lied before…so we’re supposed to believe you now? Complaining about the other team when you don’t win is what the Serbians did by filing a protest because their swimmer got beat out by 1/100th of a second by Michael Phelps. In that case, there were cameras everywhere and electronic scoring. There was almost no way it was wrong, and filing the protest just let them avoid realizing they had lost for a little while longer. But when there is strong evidence of an infraction and an investigation is launched, that is doing due diligence to maintain the rules. As you can see, the counter arguments are weak. Unfortunately, I fear the IOC is going to act like the Bush administration and delay this until it dies down and then sweep it under the table. But, in the interests of keeping the Olympics going, maybe they won’t. To do that though, they are going to have to get past trusting the “official” documents from the Chinese government. Rather, they need to get some historical documents like birth certificates and grade school reports and submit them to outside forensic analysis to test their age and authenticity.